As you walk or drive along the south-east coast of Islay, passing a succession of whitewashed distillery buildings and skirting some secluded rocky inlets, you’d be forgiven for missing the ruins of Dunyvaig Castle, perched high on a promontory overlooking Lagavulin Bay. Very little remains of this ancient stronghold, which was built on the top of an Iron-age ‘dun’ or hill fort, and the crumbling walls seem to have melded themselves back into the rock on which they stand. 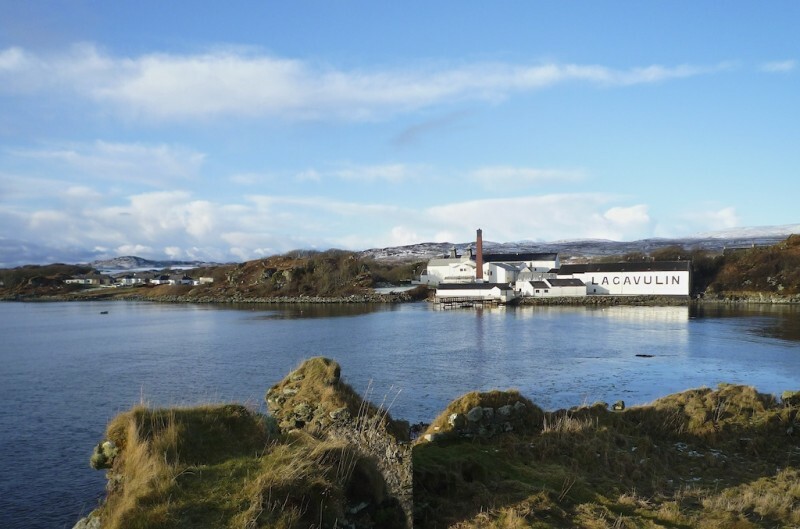 Dunyvaig was added to by successive generations, and changed hands a few times between the MacDonalds and the Campbells until 1677, when it was finally allowed to fall into disrepair. Although the castle would at one time have been quite a high and imposing structure, only a fragment of the main building still stands. Experts have identified the remnants of an inner court and an outer court within a curtain wall, and some rectangular buildings; there is also the suggestion of a barbican or fortified entrance, and a 17-foot-wide sea gate. Despite the ravages of nature and aggressive clan chiefs, Dunyvaig is still an imposing and romantic sight. You can walk to the castle and climb around the ruins, but it’s not the safest place in icy or wet weather as the rocks are slippery and there are no barriers between you and the waves below! Across the sea to the south-east is the long coastline of Kintyre, and on the southern horizon, on a very clear day, you might glimpse the coast of Antrim in Northern Ireland. The minor road which threads its way around the shore passes through some beautiful old woodland where red and roe deer feed in the shadows, before coming to an end at Claggan Bay, a wide sweep of sand and shingle. Most interesting, lovely photos. I was delighted to stumble upon The Hazel Tree for the first time yesterday, enjoying it very much. Excellent, thank you! I read that Dunyvaig comes from Dun Naomhaig, ‘fort of the galleys’, but another source (‘The Lands of the Lordship’ by Domhnall MacEacharna) casts doubt on this because he says the history of local pronunciation differs from the Gaelic ‘naimheag’ which means ‘little ship’. Thanks for the link! I think it would be so cool to travel the world looking at old castles. I love them. I never knew about this one. Thanks for sharing. Yes, it would be wonderful! Glad you enjoyed the article. Wow thank you for the history lesson…and great photos to go along with it!!! Thanks, David. Wish I’d paid more attention to history at school… but I’m enjoying learning about it now! The landscape is supremely romantic there. Many thanks! Yes, it’s wonderful. Glad you enjoyed it! Yet another of your island posts that makes me long to be there! I’d particularly like to go now, in May, when the weather’s better and there’s less chance of ice on those slippery rocks. It would be a wonderful time to go now, with the wonderful light and loads of wildlife all over the place. When we were there in winter, the whole place was a skating rink, every surface covered in thick ice. You would get out of the car, stand on the road and then gently start sliding!